An industrial accident killed two people in China on Sunday, and there have been almost 30,000 more industrial deaths this year alone. An explosion killed at least two people and injured 30 more in eastern China on Sunday. The explosion was likely an industrial accident at a factory. It caused some surrounding buildings to collapse. Industrial accidents are pretty common in China; this year alone, the country has had around 29,000 industrial deaths. 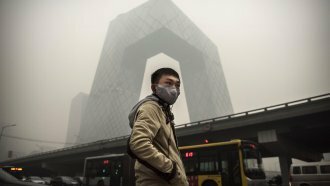 Related Story Could China Be The New Global Leader On Climate Change Reform? But that number's actually a pretty big drop from past years. In 2014, China had around 66,000 workplace deaths. And back in 2002, about 240,000 people were killed at work. For some perspective, industrial deaths in the U.S. have been under 5,000 a year since 2009. But other industrializing countries have similarly high rates. India, China's neighbor, sees around 48,000 deaths per year due to occupational accidents. There has been some push by the Chinese government to cut back on industrial accidents. The declining fatality rate shows those efforts might be working. But Hong Kong-based China Labor Bulletin says the lower numbers are partly because of a change in how workplace accidents are tallied by the government.